In the first of our sequence analysis posts, Amy M. Davis (University of Hull) examines the fantasy/animation relationship in the memorable Disney-style animated sequence from 9 to 5 (Colin Higgins, 1980). These days, I spend a lot of time thinking and writing about Snow White and the Seven Dwarfs (David Hand, 1937). Call it a professional interest during its eightieth anniversary year. 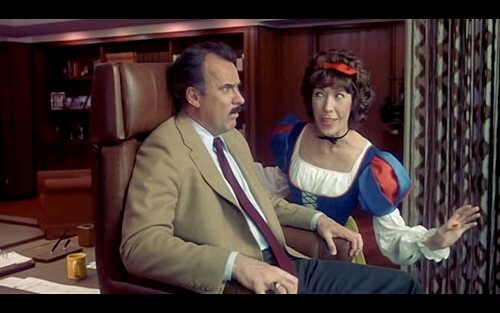 But here, rather than talk specifically about Snow White, instead I would like to look at my favourite non-Disney reference to it: Violet Newstead’s (Lily Tomlin) Snow White-themed revenge fantasy in the 1980 Feminist political comedy classic 9 to 5 (Colin Higgins, 1980). Though any working woman can tell you that 9 to 5 has never lost its relevance (sadly, given that it’s a 38-year-old film about sexism in the workplace), in the current socio-political climate and historical era (with #MeToo, wage stagnation and job insecurities for many in the middle and lower classes, etc. ), 9 to 5 has become more relevant than ever — so much so that, in July 2018, Jane Fonda announced a sequel to the film with herself, Lily Tomlin, and Dolly Parton reprising their original roles in what will be (presumably) a look at how things have changed – and how they’ve stayed the same – for working women since 1980. Inspired by the announcement about the sequel, I decided to look closely at Violet’s fantasy sequence, and think about what it does, how it functions (both on its own terms and within the context of the film as a whole), and what it tells us about the uses of animation and fantasy in cinematic storytelling. I won’t give a total breakdown of the film; if you’ve not seen it, I advise you to watch it with alacrity. (If you’ve seen it, you likely need no encouragement to re-watch it.) Instead, in the interest of brevity, I’ll cut to the chase. Violet, a senior secretary, is forced (as are many of her co-workers) to endure mistreatment from their boss, Frank Hart, who is described repeatedly in the film as a sexist, egotistical, lying, hypocritical bigot. One evening, near breaking point, Violet and two of her colleagues, Judy Bernly (Jane Fonda), and Doralee Rhodes (Dolly Parton), let off steam by fantasising about killing their boss. Three interconnected scenes follow in which, thanks to the power of cinema, rather than having the women simply describe their fantasies, we as the audience get to see each of their fantasies played out on-screen. Judy envisions hunting him like an animal and hanging his head as a trophy on her office wall. Doralee imagines sexually harassing him as he has her, then roping and hog-tying him as if he were a calf at a rodeo. But for Violet, we get something else entirely. When asked by Doralee, “What’s your fantasy for doing him in,” Violet replies, “For me, I think it would have to be like a fairy tale. You know, something gruesome and horrible and real gory…but kinda cute.” What we as an audience see, however, is much more nuanced, and in fact foreshadows much of the underlying plot for 9 to 5 as a whole. That this is couched in Fantasy elements/fairy tale allusions makes this parallel more subtle, perhaps, but I think this also makes Violet’s fantasy sequence that much more powerful as a metaphor, given how the sequence uses Fantasy elements overtly in a way that mirrors the rest of the film’s more subtle reliance on the form of the fairy tale, if not its more fantastical traits, to solve its heroines’ problems and offer the audience a catharsis. The Disney-esque touches to Violet’s fantasy are foreshadowed earlier in the scene when Violet comments, “I don’t understand guys like Hart who go out into the woods and shoot those poor, defenceless animals like Bambi and Thumper…and that cute little skunk? !” Nonetheless, when we come to Violet’s fantasy itself, its references are predominately to Snow White, though her group of animal friends who cheer her on are a combination of the animals from Robin Hood (Wolfgang Reitherman, 1973), Snow White’s bluebird friends, and – arguably – Song of the South (Harve Foster & Wilfred Jackson, 1946), both because of the bluebird on her shoulder (a la Uncle Remus on a Zip-a-dee-do-da day) and thanks to the combination of live-action and animation, an aesthetic that invokes such Disney hybrid films as Song of the South, So Dear to My Heart (Harold D. Schuster & Hamilton Luske, 1948), and Mary Poppins (Robert Stevenson, 1964) (Fig. 1). Fig. 1 - (L-R) Song of the South (Harve Foster & Wilfred Jackson, 1946), Robin Hood (Wolfgang Reitherman, 1973) and 9 to 5 (Colin Higgins, 1980). Fig. 2 - Violet in 9 to 5. Violet’s Snow White sequence opens with a shot of Mr. Hart popping his head out of his office door and ordering Violet to fetch him some coffee (Hart’s preferred method of belittling Violet). The camera then cuts to Violet (alone in the large space normally occupied by all of the secretaries), who is dressed like Snow White (Fig. 2). For an added layer of magic and fantasy, she is initially surrounded by animated sparkles (which we never see in Disney’s adaptation). But, of course, Violet is no run-of-the-mill Snow White: yes, she is patient and calm, but these, we soon learn, have a purpose. Unlike her usual, angry reaction to Hart’s order, this Snow White/Violet happily replies, “Yes, sir!” to Hart’s closed door. She then smiles in greeting to her woodland friends, and proceeds to the breakroom to prepare the coffee. Visually, it is Violet herself who most obviously invokes Snow White: her brunette bob is adorned by a red ribbon with a bow on top of her head, she has bright red lips (“lips red as the rose”), and their dresses are both blue puffed sleeves slashed with red, dark blue bodices, and long yellow skirts (Snow White’s is solid yellow, whereas Violet’s is a print) (Fig. 3). Fig. 3 - Snow White and the Seven Dwarfs and 9 to 5. But of course, Violet may look like Snow White, and she may even act (more or less) like Snow White, but this Snow White is no longer an innocent maiden; this is a Snow White who, after years of having to deal with the realities of life, has found it necessary to channel aspects of her shadow self, the Wicked Queen (Fig. 4). Fig. 4 - The Wicked Queen in Snow White and the Seven Dwarfs re-conjured by Tomlin in 9 to 5. In her performance, Tomlin wonderfully conjures up the Queen (despite her Snow White looks), particularly through a number of knowing, sideways glances to both her animal friends and to the audience (as seen in the image above, as well as one of the Evil Queen, here in her Hag disguise, wearing a very similar expression to Violet); with her devilish grin at the audience (thereby breaking the fourth wall to acknowledge our presence – and our complicity), Violet invites us to join her in taking revenge. Just as we watched the Queen create a poisonous apple for her rival in Snow White, so too do we see Violet poison Hart’s coffee. This comprises most of the middle of the sequence, as we see Violet’s ring, then see her open it to reveal some strange crystals inside. She pours these into his coffee, and the whole mug glows briefly (via an animated overlay), then a cross and bones skull materialises in the steam, chuckling menacingly (Fig. 5). Fig. 5 - Violet poisons Hart’s coffee in 9 to 5. Fig. 6 - The poisoned apple in Snow White and the Seven Dwarfs. HART: I think there was something in that coffee. VIOLET: [sweetly] I think you’re right. HART: I think it was poison! HART: I think you did it! HART: [nervously] Because I’m a sexist, egotistical, lying, hypocritical bigot? This is a fascinating moment since, apart from sticking her tongue out, Violet never really breaks from her Snow White persona, as Tomlin’s performance continues to channel Snow White’s gentleness and cheerfulness, even while she prepares to kill Hart in cold blood. Her voice remains soft and sweet, her intonation a bit sing-song. She does not demean herself by calling Hart names; instead, she encourages him to admit his faults himself. She smiles charmingly, her arms and hands extended like a dancer’s, and she remains a lady throughout (Fig. 7). Like Snow White, she reveals herself to be a true princess by her poise and grace. But without some handy dwarfs to help her, this Snow White must see to it herself that her nemesis falls to his (off-screen) death on the ground below (just as the hag did in Snow White). This is when channelling her Wicked Stepmother/shadow self comes in handy. Fig. 7 - Tomlin as Violet as Snow White in 9 to 5. We may have a vengeful Snow White, but her vengeance isn’t strictly personal. Violet is an older Snow White. An angrier Snow White. But she isn’t mean or selfish. Her vengeance, we soon learn, has a higher purpose. This higher purpose is first signalled to us by the music. For most of the sequence, the music has been the sort of Carl Stalling-esque studio orchestral music that we have long associated with Hollywood cartoons. Yet as Violet enters Hart’s office, coffee cup held aloft as if she is bringing him an offering, for a couple of bars the arrangement of the music shifts: instead of an orchestra, we hear a fife and drums arrangement that takes the form of the opening of a simple yet triumphant march. For American audiences in particular, this should bring up an immediate cultural association with the Revolutionary War; at this moment, Violet becomes a revolutionary — the common woman seeking to overthrow an unjust tyrant. Though the music quickly returns to an orchestral arrangement, we have been given important information about Violet’s ultimate cause — not revenge, but change. This theme of revolution — of the overthrowing of a tyrant (here literally, as he is thrown over the window ledge to his death) — is depicted most obviously as the sequence reaches its climax and conclusion, which becomes even more suffused with fairy tale references. To complete the fairy tale elements of the sequence, Violet – looking contentedly out the window at Hart’s smashed corpse – dissolves in a cloud of sparkles, reappearing in the next shot dressed as a fairy tale/Medieval princess alongside Judy and Doralee. To show that Violet’s actions were ultimately selfless and pure, we then cut to several shots of a dungeon where other secretaries (whom we recognise as characters from earlier office scenes), dressed as filthy, medieval peasants, work in misery, literally shackled to their typewriters. More animated sparkles appear as their shackles fall away, and a chorus is heard singing “Hallelujah” as the women are liberated from servitude. We then cut to our three heroines toasting their success from the balcony. The camera then draws back to reveal the balcony to be part of a pink castle surrounded by a pink and blue glow, and invoking the Disneyland castle, so familiar in 1980 to generations of film and television audiences. Fig. 8 - The magic castle in 9 to 5 and Sleeping Beauty Castle, Disneyland (Anaheim, California). Taken together, all of these fairy tale references (Disney or otherwise) fulfil a number of functions. For one thing, the sequence — particularly given its position in the overall scene as the final (and arguably climactic) fantasy sequence — ties 9 to 5 as a whole to utopian fantasy as a sub-genre. Violet’s fantasy is the only one that shows her fellow employees directly benefiting from her murdering Hart, thereby raising her fantasy to the envisioning of a utopian ideal, rather than positioning it as a tale of straight-forward revenge such as those that Judy and Doralee imagine. Fairy tales often end in an idealised success for the hero(ine): they vanquish an evil-doer who is oppressing the ordinary people, and they elevate the main character to live a better life (one which often benefits those around them as well) so that “they all live happily ever after”. Cinema often does this too, and certainly 9 to 5 does this: the film as a whole ends with Mr. Hart (the oppressive, evil-doing “sexist, egotistical, lying, hypocritical bigot”) being removed by the Chairman of the Board, Mr. Tinsworthy, who, in this sense, functions as the wise and benevolent fairy tale king (Tinsworthy sends Hart to Brazil to oversee a new operation the company is starting there; we learn at the film’s conclusion that Hart was abducted by a tribe of Amazons in the Rainforest, and was never heard from again). Meanwhile, over the course of the film as a whole, Violet (supported and assisted by Doralee and Judy) has taken advantage of Hart’s “absence” from the office (she, Doralee, and Judy are forced to kidnap Hart to keep him from harming them, and coverup his absence through a series of pragmatic and comedic machinations) to create the idealised office working environment, bringing in such innovations as job sharing, on-sight daycare facilities, flexible hours, equal pay, and a more personalised, aesthetically-pleasing, inclusive, and comfortable office environment – changes which raise the morale of the employees and result (unsurprisingly, to anyone who’s never worked in management) in increased productivity. Though Hart manages to take credit for these improvements, Violet nonetheless is finally rewarded with a promotion, and presumably goes on to maintain and protect the improved working conditions for herself and her colleagues. This is what both cinema and fairy tales do best — they gives their audiences a happy ending that allows the audience both to dream of a better tomorrow and to have hope that they, too, might live happily ever after, just like the hero(in)es. Given Disney’s position within cinema as the chief teller of fairy tales (even Disney films that aren’t fairy tales function as such, as I have argued elsewhere), 9 to 5, by using Violet’s fantasy to align itself to Disney and fairy tales (and in particular by aligning itself most heavily with Snow White and the Seven Dwarfs, Disney’s first feature-length film), positions itself, intentionally or otherwise, within a modern form of the fairy tale genre. Though the majority of the film does not position itself explicitly as Fantasy (in the sense that nothing happens in the majority of 9 to 5 that is not possible/plausible in the real world) — in fact, 9 to 5 is typically classified as a Political Comedy — the Utopian elements of the film’s conclusion do align it with Fantasy in the fairy tale sense, and in the process render the whole of the film as a modern fairy tale. The film is about what might happen, what could happen, with a bit of luck, and pluck, and our heroines’ determination to defeat their foe. This is exactly what happens in 9 to 5, and in an echo of their toast on the balcony in Violet’s fantasy, Violet, Doralee, and Judy toast in Hart’s (now former) office to celebrate their success, their revolutionary intentions to ensure that all people are created equal signalled (once again) with a reference to the American revolution, this time visually by costuming the characters in red, white, and blue dresses (foreshadowed, as seen in the images below, in the pastel shades of their princess dresses, which echo the primary colours of the dresses they wear at the end of the film in “real” life) (Fig. 9). Fig. 9 - Violet, Doralee, and Judy celebrate the outcome of their revolutionary intentions. That such a strongly feminist, political film relies – both overtly, in Violet’s fantasy sequence, and more subtly throughout 9 to 5 as a whole – on the essential form of the fairy tale plays into the need that all of us – children and adults alike – have to make sense of the world and our lives; to do so through story is a tactic as old as our species, so the form for those stories – the fairy tale – is equally old. 9 to 5 does not offer its audience any actual, practical solution to the problems of sexism, discrimination, and harassment in the workplace. After all, holding your boss hostage for six weeks while forging his signature on a series of memos and directives to change company policy isn’t really a viable solution for most people’s problems any more than the three women’s fantasy solutions – lassoing him and roasting him, shooting him and mounting his head on your wall, or poisoning him and throwing him out of a window – are for Doralee, Judy, or Violet. But the film offers us catharsis – the knowledge that these problems are universal – and allows the audience the chance to escape into the fantastic notion that a magical solution will present itself and all of our problems will be solved. That this is most heavily foreshadowed by the Snow White sequence is an interesting choice of allusion for the film. The critique of Disney’s so-called “princess films” as being unfeminist had yet to emerge in 1980 on a popular level. Indeed, the idea of these films belonging to a group of “Disney Princess Films” was also limited, given that, at that time, there were only three: Snow White and the Seven Dwarfs, Cinderella (1957), and Sleeping Beauty (1959). Far from treating these films as problematic, however, the overtly feminist film 9 to 5 celebrates the princess as a powerful figure, and turns a depiction of a grown-up Snow White into a woman who has learned to combine her darkness with her light so that she can overthrow her oppressors and lead her people out of a “pink collar ghetto” into a glowing pink castle in the sky. Here, the Patriarchy ignores and demeans the Princess at its own peril.